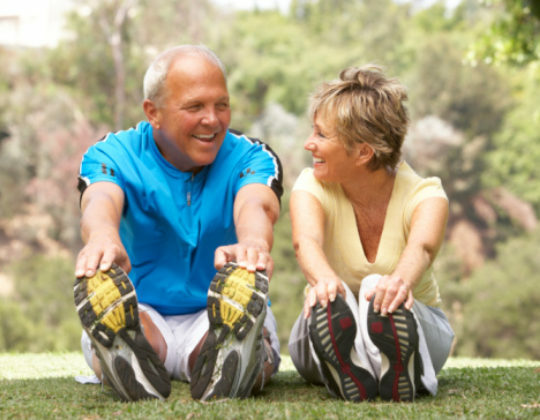 Top 10 Reasons Boomers Should Exercise! It’s becoming increasingly clear to the medical community that it’s just as important for older adults to stay active as it is for their younger counterparts. Exercise helps maintain mobility and stamina, reduces the incidence of disease, and leads to an overall better quality of life. ACE, America’s Authority on Fitness, shares the following reasons why older adults need to get plenty of safe and appropriate exercise. 1. To increase bone density and prevent osteoporosis. As we live longer lives, osteoporosis is affecting an ever-larger number of elderly – becoming one of the major health problems associated with old age. It affects some 20 million women and 5 million men and leads to more than 250,000 hip fractures each year. Exercise delays the onset of osteoporosis by increasing bone strength. 2. To improve self-efficiency and maintain independence. One of the top concerns of the elderly is losing control, becoming dependent or a burden to someone. Exercise helps older adults maintain a greater capacity to undertake the activities of daily living. Strength training increases muscle mass, which elevates metabolism. This may also lead to a reduction in overall body fat percentage. 4. To maintain balance and improve reflexes to decrease falls. As adults age there is a natural decline in balance and coordination, which can be postponed and even prevented with proper strength and balance training. 5. To create a sense of community or feeling of belonging. Exercise groups enhance social interactions for many older adults who may not otherwise leave their homes. New friendships are also stimulated during group exercise gatherings. 6. To improve pulmonary function. Pulmonary function declines with age due to the degeneration of the vertebral disks, which alters the shape of the thoracic cavity. Physical activity, which decreases the amount of vertebral degeneration and increases the strength of the thoracic cavity, may lead to improved pulmonary function. Exercise reduces the incidence of depression and improves self-esteem while providing a feeling of accomplishment. 8. To help prevent and regulate diabetes. Aerobic exercise has shown to be an important means of preventing and treating non-insulin-dependent diabetes by helping regulate blood glucose levels. 9. To improve flexibility, joint range of motion and functional movement. Physical activities that require the body to go through the full range of movement helps keep the body flexible and mobile. Circulation is also increased. 10. To improve cardiovascular strength. Cardiovascular exercise helps maintain a healthy heart and cardiovascular system reducing the risk of heart disease. Appropriate physical training has shown improvements in most aspects of cardiovascular functioning. Printed with permission from The American Council on Exercise (ACE), America’s Authority on Fitness, a non-profit organization dedicated to promoting the benefits of physical activity and protecting consumers against unsafe and ineffective fitness products and instruction. As the nation’s “workout watchdog,” ACE sponsors university-based exercise science research and testing that targets fitness products and trends. ACE sets standards for fitness professionals and is the world’s largest nonprofit fitness certifying organization. For more information on ACE and its programs, call 800.825.3636 or log onto the ACE Web site.